N. pseudonarcissus which are known as "daffodils"). The often forced paperwhite (N. tazetta papyraceous) belongs here. Except for a few yellow types like 'Grand Soliel d'Or', tazettas are mostly white with white, cream or yellow cups. They have clusters of many small flowers and are intoxicatingly fragrant. Due to their earliness of bloom, tazettas are often associated with freeze damage. Many a bouquet has been picked the day the "northern" blew in. As a rule, the true paperwhites are very, very, early blooming (Christmas or New Year's even), have pure white delicate flowers, and have a scent somewhere between cotton candy and fresh manure. Some love it while others despise its cloyingness. True paperwhite foliage is wide and grayish green. They are most often found naturalized along the gulf coast where the winters are mild but are fairly abundant in East Texas as well. narcissus in the South are several hard to distinguish variants each of the later blooming cultivars 'Pearl' and 'Grand Primo'. The "Pearls" seem to be whiter and earlier, while 'Grand Primo' is the latest and initially upon opening has a citron-yellow cup. It appears that 'Grand Primo' was sold and passed around for years under the name of 'Grand Monarque'. very well and like other narcissus makes an excellent dried flower. as they should bloom and survive indefinitely. 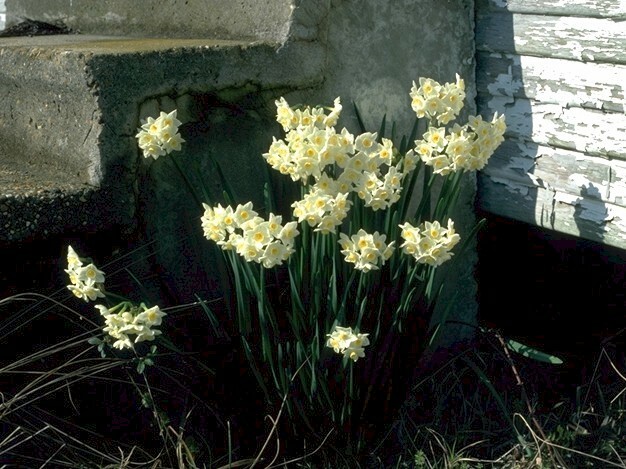 In addition to abandoned East Texas homesites, an outstanding source for tazetta (polyanthus) narcissus is William R. P. Welch, P.O. Box 1736, Carmel Valley, California 93924-1736. Telephone: 408-659-3830.